Ubiquitination is a frequently occurring and very diverse posttranslational modification influencing a wide scope of cellular processes. Ubiquitin (Ub) has the unique ability to form eight different lysine-linked polymeric chains, mixed chains and engages with ubiquitin-like (Ubl) molecules. The distinct signals evoked by specific enzymes play a crucial role in, for instance, proteasome-mediated protein degradation, cell cycle regulation, and DNA damage responses. Due to the large variety of cellular functions that this posttranslational modification influences, the enzymes that construct such Ub modifications, and subsequently controle and degrade these signals, is enormous. 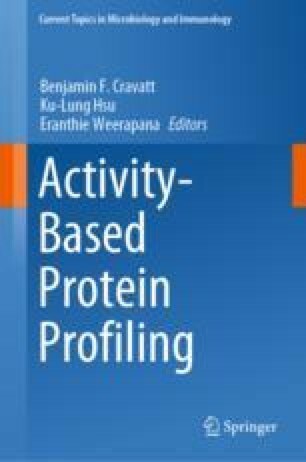 In this chapter, we will discuss the current state-of-the-art of activity-based probes, reporter substrates, and other relevant tools based on Ub as recognition element, to study the enzymes involved in the complex system of ubiquitination.